This is the first 1990 Spanish edition of The Dark Wind, which is the fifth Tony Hillerman Navajo Mystery novel. 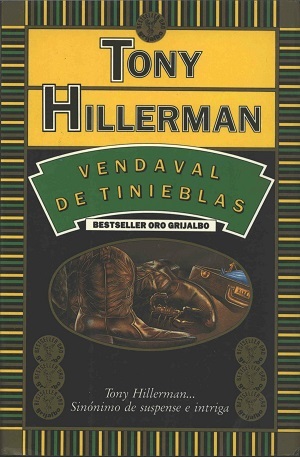 This paperback edition was published in Barcelona, Spain by Ediciones Grijalbo, S.A. Tony Hillerman’s original English text was translated into Spanish by Maria Antonia Menini, and the title directly translates to “Gale of Darkness”. The cover art was designed by Enric Satue, and elements from the 1983 Avon edition of The Dark Wind, such as a pair of boots, a scorpion, and a suitcase of cocaine, are represented in an oval in the center of the cover. Binding: Paper covers and the front cover and back cover have fold-outs containing a synopsis of the book and other works published by Grijalbo. The cover art is a banded border and an arched panel for title and with the Oro bestseller medal. Additionally, there is an oval with elements from the plot in the center. The spine has the author, title, and Oro Bestseller medal printed vertically.